Palazzo "PATRICIA" directly on Lake Lugano, Lugano, Porto Ceresio. Property 3: Palazzo "PATRICIA" directly on Lake Lugano, Lugano, Porto Ceresio. Stunning lakeside villa with direct lake access. Mooring. Walking distance to restaurant. WIFI. BBQ. Property 32: Stunning lakeside villa with direct lake access. Mooring. Walking distance to restaurant. WIFI. BBQ. Home away from home - we loved it! 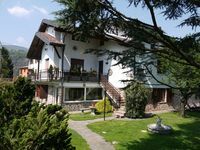 The property was very well located with close access to a supermarket, cafes and the train station and Lake Lugano. It was a great base to have in the area, in a quiet location. The house was very comfortable for the 4 of us with all facilities that you would need whilst on vaction. It was close to the train station,which gave us another option of travelling in the area eg. Varese, Milano. We were also able to park our hire car securely in the property. Our hosts, Domenico and Marriet were very nice and ensured that our accomodadation had everything we needed including a well stocked pantry, laundry and bathroom cupboard. Clean towels and sheets were also provided for our second week. We would highly recommend this property to anyone wanting to stay in this area. We hope to be able to visit the area again and stay at this property at some time in the future.